A warm summer night together with a glass of Prosecco and a lot of beautiful music. This is the way we invite you to spend the first day of the summer holidays. 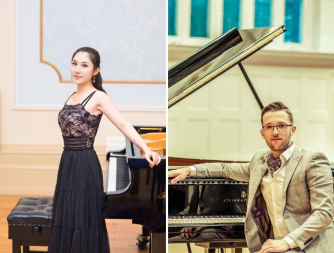 A piano recital featuring award winning pianists Yaoying Wang and Nicolae Mihaila which promises to take you all on a wonderful musical journey. The programme performed will be a varied one which we are sure will cover all tastes. A surprise artist invited to take part in this wonderful recital will be revealed two weeks before the recital. Immerse yourself in this special recital which we think will be the perfect way to start your Summer Holidays. Pianist Yaoying Wang has performed in major venues including the Purcell Room Royal Festival Hall, St Martin-in-the-Fields, St John’s Smith Square, St James’s Piccadilly, Kings Place London, The Steinway Hall UK, Marlow Piano Society, Liaoning Grand Theatre, the Blackheath Halls and Polish Hearth Club. She has also played piano concertos with several Orchestras across UK and Asia, won top prizes including the Asian TOYAMA Cup Piano Competition and the Yamaha Piano Competition. She has recently been awarded “The 2017 U.K. ‘Ten Outstanding’ Chinese Young Person” Award by Big Ben Award, UK; First prize at the 2017 Leonard Smith and Felicity Young Duo Competition with her duo partner, violinist Elena Abad, Finalist in the 2016 John Longmire Piano Competition and the Alfred Kitchen Piano Competition. Yaoying gave her first pubic performance aged seven. She studied with Prof. Dan-Wen Wei, one of the few students of the great pianist Vladimir Horowitz. In 2004, she entered the Shenyang Conservatory of Music’s pre-college with the highest mark in the audition for admission. After being accepted by several world-class conservatories and receiving multiple scholarships, Yaoying decided to study in London in 2009. In 2013 she received her Bachelor of Music degree with honours from the Royal Academy of Music and Master of Music degree from the Royal College of Music in 2015, studying with leading English pianist Colin Stone and international concert pianist Gordon Fergus-Thompson. Yaoying recently completed her Postgraduate Artist Diploma at Trinity Laban Conservatoire with a distinction, studying with piano professor, Deniz Gelenbe and the head of the keyboard department, Peter Tuite. She was supported by the Leverhulme Arts Scholarship, the Alfred Kitchen Scholarship, Trinity Laban Award Scholar and Trinity College London Scholar Award. She has participated in many international music festivals, such as London Master Class, Music Fest Perugia and Beijing International Music Festival; had masterclasses with famous musicians such as Mitsuko Uchida, Christopher Elton, Ilana Vered, Hamish Milne, Norma Fisher, John Perry, Pascal Roge, Pavel Nersessian, Pascal Nemirovsky, Ian Fountain, Jerome Rose, Olivier Gardon and many others. Nicolae Mihaila started to play the piano at the age of eight under the guidance of Prof. Fekete Elisabeta. After two years, in which he excelled rapidly, he received a unique opportunity to perform Haydn’s D major Piano Concerto with the Oradea State Orchestra to an audience of over 1,000 people. Consequently it did not take long for him to be recognised as a child prodigy. After the first five years of study and hard work, winning prizes at national and international competitions, travelling across Romania and Europe doing solo recitals and concerts with orchestra, he was awarded the “Brilliant Child of Romania” trophy in 2005 at the “V.I.P. Gala” awards where he had the honour to receive his prizes on the same stage with Romania’s then president, Traian Basescu, along with other famous people from across the arts, television, politics and sport. Throughout his career so far, Nicolae has collaborated with many internationally acclaimed conductors, such as: Timothy Redmond (UK), Walter Hilgers (GER), Iosif Conta (RO), Claudio Villaret (CHE), Rinaldo Muratori (IT), Yukko Amanuma (JPN), Sabin Pauta (USA). In 2012, Nicolae was offered a chance to start his undergraduate studies at the prestigious Guildhall School of Music and Drama, London, under Prof. Ronan O’Hora. Upon graduating with a Bachelor degree in 2016, he decided to continue his study at the Guildhall to obtain his postgraduate Masters Degree. The 2018 season will include performances in England, Germany, Romania and Austria.